Y'all, seriously, where did October go?! This week kicks off the "season" for us where there are warm smells from baking and mornings filled with hot chocolate and electric blankets at night and footy pajamas and fuzzy socks and parties and time with friends and all things family. It is a constant stream of activity from now until after the New Year. Oh how I love November and December! All of the celebrations from the solemnity of Veterans Day to the beauty of Thanksgiving to the joy of Christmas make me all warm and fuzzy inside - or it could just be the hot chocolate and footy pjs. 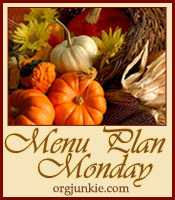 This is part of Organizing Junkie's Menu Plan Monday.